Annual Research Shows Homeowners Would Rather Walk Around in Their Underwear At Home Than Spend Money to Cool Down Their Houses SURVEY HIGHLIGHTS: - Room to Improve: When asked to grade their household on how well they conserve energy at home, nearly two-thirds of homeowners rated themselves above average with an 'A' or 'B' letter grade (62 percent). - Money Matters: Eighty-four percent of homeowners are willing to endure higher temperatures at home in the summer months in order to save $50 on their electric bill. - Comfort is Required: Results indicate homeowners' desire to keep comfort levels high and bills low -- 33 percent would rather strip down to their underwear than spend money to cool down the house, a 4 percent increase from 2017. RICHARDSON, Texas, June 21, 2018 /PRNewswire/ -- While class has been dismissed for the summer, Lennox, a leading manufacturer of innovative home comfort products, put homeowners to the test one more time before the official start of summer, and found that while most would pass when it comes to energy efficiency know-how, many may want to hit the books to learn more about how to save money on energy bills and stay cool this summer. 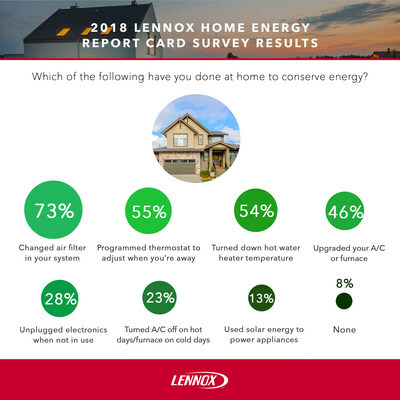 The Lennox Home Energy Report Card Survey, commissioned by Lennox Industries and conducted by GfK Roper, asked about how people use and conserve energy at home – and what they're willing to do to save money on summer bills. The survey found that homeowners have mix reactions when receiving a high summer energy bill. In fact, close to one-third (31 percent) of homeowners would turn up or off the thermostat, while another 28 percent said they would search for unused appliances to unplug. Others start turning off lights or research ways to save energy. Homeowners gave themselves above-average marks in energy conservation. 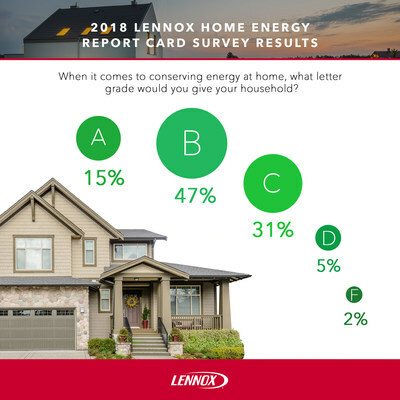 When asked to grade their household on how well they conserve energy at home, nearly two-thirds of homeowners rate themselves above average with an "A" or "B" letter grade (62 percent). Fifteen percent of homeowners gave themselves an 'A,' (a 6 percent decrease from 2017), 47 percent gave their household a 'B' when grading their household energy efficiency, and 31 percent gave themselves a 'C.' Although a large majority (92 percent) have taken steps to conserve energy, it's clear that a number of homeowners see the opportunity for increased efforts. More than 90 percent of homeowners are taking steps to conserve energy in their home. Fifty-five percent of homeowners are programming their thermostats to automatically adjust the temperature when they're away, and 46 percent of homeowners bought new, more efficient air conditioning and heating systems. "Most homeowners recognize that improving the energy efficiency of their household to save energy and reduce electricity bills doesn't have to take a lot of time and effort," said Lennox energy efficiency expert, Brittani Youman. "Fortunately, there are a few simple steps that can make a big impact on controlling costs, conserving energy, and beating the summer heat, starting with doing some basic things, like changing the air filter on your cooling system, using low-energy appliances and conserving by taking advantage of home automation." While homeowners show that they are willing to take steps to conserve energy, they are not likely to sacrifice their comfort over savings. When asked how willing homeowners are to turn the thermostat up to save $50 dollars a month on their utility bill, 37 percent would be willing to raise their thermostat three to six degrees, while 26 percent would not go any higher than one or two degrees. Changes in weather aren't the only reason homeowners are motivated to crank up (or down) the A/C. The survey found that 46 percent of homeowners will turn on their air conditioning system for the first time of the year in May or June, while 9 percent of homeowners run their A/C system year-round. When asked to name the family member who complains most about hot or cold temperatures, the female head of household was identified 52 percent of the time, while 26 percent chose the male head of household. While many people proactively take positive actions toward lowering energy bills, some do earn a failing grade for doing more harm than good. Twenty-three percent of homeowners said they have turned off their cooling system completely during hot days or heating systems on extremely cold days to conserve energy. "While turning off your air conditioning system completely seems like an effective way to conserve energy during the summer, it is actually forcing the system to work overtime to get back to a comfortable temperature," said Youman. "Doing so uses more energy and results in higher bills. Instead of turning off your system, we recommend lowering or raising the temperature of your thermostat – or better yet, install a smart thermostat to do it for you." Luckily, homeowners have an opportunity to improve their grade by entering the Lennox Energy Savings Superstar Contest. Between July 1 and August 31, 2018, Lennox invites homeowners to go to Lennox.com to submit a unique and innovative home energy savings tip, along with a fun photo depicting their suggested tip. The grand prize winner will receive up to $10,000 in energy efficient Lennox heating and air conditioning products, along with other "cool" prizes to help them beat the heat this summer. 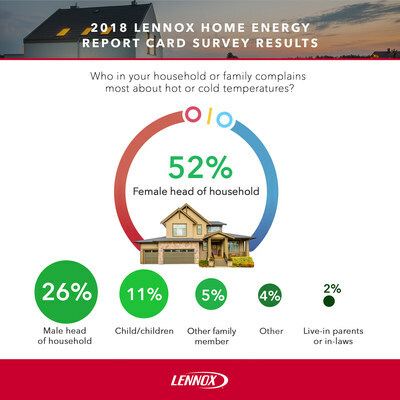 The results of the Lennox Home Energy Report Card survey are based on a telephone survey that was conducted by GfK Roper on behalf of Lennox Industries among 734 homeowners (ages 18 and over) within the U.S. during April 2018. Full survey results are available upon request by calling Matthew Pardee at (214) 379-3709. Lennox Industries is a leading provider of customized home heating, cooling and indoor air quality products that are designed to deliver customized comfort, efficiency and functionality, with the most innovative and reliable features available. Lennox has been honored four times by the U.S. Environmental Protection Agency and the Department of Energy as an ENERGY STAR Manufacturing Partner of the Year for its outstanding contribution to developing and promoting energy-efficient products. For more information about Lennox home comfort products, visit http://www.lennox.com, call 1-800-9-LENNOX, or find us on Facebook, Twitter or Google+. The information provided herein is subject to change without notice. Lennox makes no warranty or guarantee of any kind, express or implied, regarding the information set forth herein, including without limitation any warranty regarding its currency, accuracy or completeness or any warranty of merchantability or fitness for a particular purpose.